This page summarises the local government organisation of Devon since 1889. 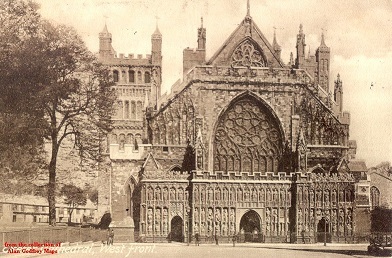 Devon County Council was formed in 1889, and in 1894 a network of boroughs, urban district and rural district councils was formed across the county. Devon (or Devonshire) initially had 12 Boroughs: Barsntaple, Bideford, Dartmouth, Devonport, Exeter, Great Torrington, Honiton, Okehampton, Plymouth, South Molton, Tiverton, and Totnes, though Okehampton had only become a borough in 1885. All were Municipal Boroughs except Devonport, Exeter and Plymouth which became County Boroughs in 1889. Torquay became a Municipal Borough in 1892. Torquay would become part of Torbay County Borough in 1968. From 1894 there were also 24 urban districts, a remarkable number given the county's predominantly rural nature. These had less prestige than boroughs, and did not have the right to elect mayors or aldermen. These were: Bampton, Brixham, Buckfastleigh, Budleigh Salterton, Cockington, Compton Gifford, Crediton, Dawlish, East Stonehouse, Exmouth, Ilfracombe, Ivybridge, Kingsbridge, Lynton, Newton Abbott, Northam, Ottery St Mary, Paignton, Salcombe, Seaton, Sidmouth, St Mary Church, St Thomas the Apostle, and Teignmouth Urban Districts. Heavitree became an Urban District in 1896, Ashburton and Tavistock in 1898, Holsworthy in 1900, and Axminster in 1915. Not surprisingly, a few of these UDCs had short lives. The following would be abolished, absorbed by neighbouring councils: Compton Gifford (1896); Cockington, St Mary Church, St Thomas the Apostle (all 1900); Heavitree (1913); Bampton, Ivybridge (both 1935); Axminster (1953); Holsworthy (1964); Tavistock (1966). A major amalgamation was of Devonport CB, Plymouth CB and East Stonehouse UDC which became a new Plymouth County Borough in 1914. This achieved City status in 1928. Torquay MB, Brixham UDC and Paignton UDC were amalgamated as Torbay County Borough in 1968. South Molton became a Rural Borough as part of South Molton RDC in 1967. There were also 17 Rural District Councils covering the areas outside the major towns, but these had less powers. Initially most were based on the Unions, met at the Workhouse, and had the Guardians serving as councillors. These were: Axminster, Barnstaple, Bideford, Broadwoodwidger (abolished 1966), Crediton, Culmstock (absorbed by Tiverton RDC in 1935), Honiton, Kingsbridge, Newton Abbott, Okehampton, Plympton St Mary, South Molton, St Thomas, Tavistock, Tiverton, Torrington, and Totnes Rural Districts. In 1974 there was major reorganisation and Devon had a 2-tier structure, with a County Council and ten District Councils. These were: City of Exeter, City of Plymouth, East Devon, Mid Devon, North Devon, South Hams, Teignbridge, Torbay, Torridge, and West Devon. However, in 1998 Plymouth and Torbay both became unitary authorities.